As a loot shooter, Destiny 2, lends itself to continue dropping precious loot at our feet. It’s one of the core game loops. We shoot, we kill, we get loot. But one of the more troublesome prospects of always having an ingress of loot is inventory space: personal or vault. As the system works now, every single piece of loot is given to you and automatically looted. If you miss a piece of loot, that item is sent directly to the postmaster. If you have no room for that piece of item, it too sends directly to the postmaster. This is a beneficial quality of life system to have, but it can also become very cumbersome. Especially in the loot shooter genre when everything gives you loot. So I’m going to be making a case for a more streamlined and classic loot system that gives players a more meaningful experience when looting and organizing inventory space. The main culprit of this blog post is Shaders. There are too many to carry, and it’s troublesome to get rid of them as you have to dismantle each Shader individually. Often times after a long session, I find my postmaster filled with Shaders I’ve collected and I can’t collect them because my Shader inventory is full, and dismantling each and every one of the Shaders that I don’t like or am willing to part with creates a huge amount of downtime. Simply put, no one wants to sit there for 20 minutes dismantling things. To Bungie’s credit, they implemented a recycling system in Cryptarch Rahool’s menu that allows for mass dismantling of 5 Shaders at a time. But then the inventory remains cluttered if you can’t keep these stacks in multiples of 5. The same is true for Blue weapons and armor and all kinds of items that seem to just pile up in the postmaster and/or in your personal inventory. KADI 55-30 loves all your lost loot. This is where a streamlined Loot system comes into place. Borrowing from the time-honored loot system of MMORPG’s and general RPG’s like Diablo and World of Warcraft—you have a choice in what you want to keep. With the current system, you either dismantle items when you get it or dismantling items en masse at the postmaster. In order to fix the current system, we have to set some rules right? What is automatically looted to you, and what is an item that qualifies as optional loot? Well, let’s start with Key Items. A staple term in classic RPG’s. These items would be essential items in Destiny 2 such as Quest items, pursuit items, and currency (Glimmer, Masterwork Cores, Legendary Shards, planetary materials, faction rep coins, etc.). Now that we’ve got those covered, let’s talk Optional Items or loot that you can choose to discard right on the spot. 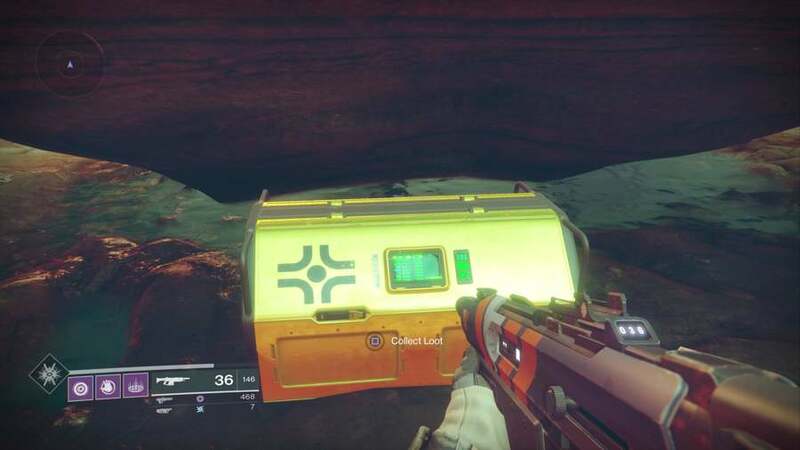 An example of this working would require making enemies drop Loot chests IF they have any such significant loot to be had. Currently, they drop engrams that either decrypts on the spot or needs to be decrypted by a Cryptarch. What about public enemy number one? Shaders? Currently, they too are looted automatically or sent to the postmaster. How would this work in a traditional loot system? Enemies that have the consequential loot to be had will drop a loot chest, and as players do currently, they will have to hold the action button to loot it. Rough mock up of Loot Window. Tokens and glimmer auto looted. Now you have a choice. In the above mockup, I’ve detailed how items such as Glimmer and Tokens would continue to be automatically looted. The window that opens up, is a result of them looting the chest. Now they can decide what to do with the contents within. They can dismantle the Shader for whatever it’s worth which would auto loot. Or they can take it. Of course, in traditional fashion, you could also just Take All if you really want to. But at least this now gives you a choice. With this system, you are not resigned to taking each and every loot that drops and doing house cleaning when you get back to the Tower. Instead, you decide on the spot whether you want something or not. This is especially true for Shaders. Because realistically we either have the Shaders we want or have certain Shaders we want to collect. And our inventory and postmaster is perpetually piled up with inconsequential Shaders that I’ll never care about. We all have our favorite colors. So instead of letting them pile up in the inventory (of which we don’t even have room for all Shaders) and the postmaster; this solution would at least let people decide which items to loot, and thus create a more organized manner in which our inventories are filled. With every single object being automatically looted whether we want it or not (we stepped into a war with the Cabal on mars), it leads to a massive cluster of items you neither want or would ever care for. With this system, the items you need will go to you magically. The items you don’t need—you can either take or dismantle on the spot. At least this way you’re not always piling up stacks of Shaders and items you don’t even want. The current loot system works, yes. But in terms of quality of life improvements—I am a firm believer that this system would work wonders for organization purposes and keeping inventory spaces free from clutter.